We headed into the weekend in good spirits after having good speed and a Top 5 finish from the last races at Thunderhill. SCCA San Francisco Region had no official test day planned but we were able to sign up with Speed District and get a race car run group for testing on Friday. After packing my gear, tools, spares and promo items Thursday night it was an early morning drive to WeatherTech Raceway Laguna Seca on Friday morning. The forecast had been changing throughout the week and it now looked like lunch time rain. The morning sessions were cloudy and ominous but the track stayed dry. The first session was dedicated to car checkout, feeling the grip levels and reviewing my visual reference markers while out on track. The second session I was back up to my pace from last year. At the end of the second session the rain came. It was interesting going from fast laps in the 1:41 range to dancing around a wet track on full slick tires resulting in lap times closer to 2 minutes. After the session I quickly changed over to my set of wet tires, fueled the car and changed to a clear helmet visor. Heading out on to a soaking track was an interesting exercise. A few corners still had good grip and a few others like Turn 3 and 9 had small rivers flowing across. The next few sessions were an excellent opportunity for practicing car control. Many of the other drivers decided to skip the wet session, this meant there were very few cars out on track. Despite my driver suit getting soaking wet it was a lot of fun. The next session we disconnected the rear sway bar and that helped to get the car off the corners better. As the rain was easing off the track conditions were changing and I practiced various lines and tired to focus on feeling what the car was doing. With the rain ending and the track starting to dry out in areas it was time to switch back to slicks. The first few laps were interesting in certain corners. I locked up the brakes two times, once heading into Turn 5 and another braking for the slow Turn 11. I was able to keep going both times but dramatically overshot my turn in points. As more cars started driving out on track and the sessions progressed the track dried out very quickly. I spent the next few sessions focusing on the test plan: higher entry speeds in Turns 4, 5 and 6 and more throttle in the tricky Corkscrew and Turn 9 section. Unfortunately heading out for the penultimate session of the day the #14 White car of Jonathon Allen spun in front of me exiting Turn 3. I went outside and thought I was clear until he just tapped my right rear corner on the tail. I continued on exiting Turn 4. Then in my mirrors I saw my rear tail peeling off the car and going flying into the air. The next lap around I saw between Turns 4 & 5, it of course landed paint side down and skidded to a stop off the racing line. I finished out the session and when I pulled into the paddock it was there waiting for me. The contact had damaged the rear body pins and their mount points. The air flow had then caught under the tail and ripped it right off the car bending and tearing the pins in the process. One of the rear mounts needed welding. Thanks to Ric at CSR Performance for braking out the welder and providing a couple new body pins. Luckily no one had hit tail but it had one smashed corner, cracks in both wheel wells and a fair amount of ground off paint. I wasn’t going to be able to make the last session. I spent the rest of the afternoon doing trackside repairs and patching the fiberglass back together with a combination of aluminum stiffening panels, rivets and a roll of duct tape. After the repairs were complete I ran through my evening checklist and got the car ready for the morning practice session. My wife’s family was in town so I joined them for dinner before heading back to the hotel room to study my data and update my track notes. Despite the old worn out tires the car felt great on track and I had a fun practice session putting together some work from the test day. On my last lap out, I set a new personal best time of 1:40.650. A blinding fast lap, using all the track and really pushing the limits of grip. It was good enough to place me at the top of the time sheets. A fantastic feeling after having to repair the tail yesterday afternoon. Unfortunately qualifying didn’t go as planned. I made a mistake in the Corkscrew on a flyer and broadsided the tire wall. The ButlerBuilt Seat and Head Support System really helped and I came away uninjured. Despite the steering wheel being at a weird angle, I was able to drive the car back to the paddock to check it over. The left rear wheel had about an inch of toe out, the left front nose was cracked, left bodywork all scratched up and the rear tail was smashed on the left side this time. We spent the afternoon repairing the damage. More aluminum sheet, rivets, duct tape, a little welding and resetting the suspension alignment. Back at the track Monday morning I was greeted by my friend Emmett and his son Aidan, who had came to spend a day at the race track. 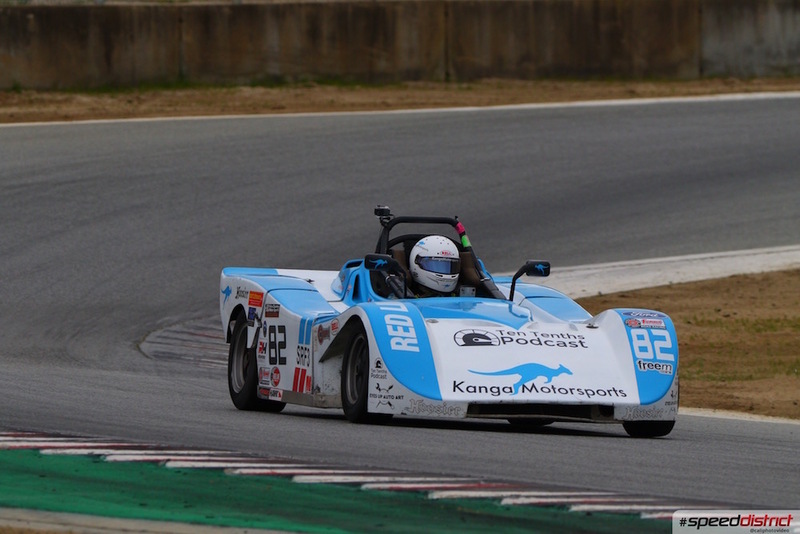 Emmett used to race with SCCA and has helped Kanga Motorsports on many occasions with little small jobs such as bushings for the seat belt holders, welding up the leaky expansion tank and providing advice. It was great to see them and get to spend a day showing them the car and all the racing action. Unfortunately my mistake in qualifying meant I didn’t get a good time and I started from 20th place for Race 3. I got squeezed and didn’t make the best start. By the end of the first lap I was up to 18th place. A few laps later I was up to 14th. Then on lap 8 heading into Turn 6 the #88 of Court Cardinal must have missed the yellow flag, due to a stricken car on the outside. He dove to the inside as I was turning in. There was contact and I was sent off into the gravel trap. I tried to get going but was beached. I spent the rest of the race watching the cars fly by in my mirrors. I finished dead last. Thankfully the Emergency crew was able to tow me out of the gravel trap and I returned to the paddock under my own power. I tried to stay off the racing line as my car shed the rocks and stones it had collected. After speaking to the stewards in impound I had very little time left to prepare for qualifying. Luckily my buddy Emmett and my wife Meghan were available to lend a hand. As I checked over the car, Emmett worked to change the front and rear tires. With a borrowed ShopVac (Thanks Jerry), Meghan worked to remove the thousands of rocks and stones that filled the radiator, front belly pan, side pods and cockpit. She removed three full bucket loads before she was done. The rear toe was again knocked out of alignment and we had to re-string the car to make adjustments. With a few minutes to spare I donned my drivers suit and headed over to grid just in time for qualifying. Big thank you Emmett and Meghan I wouldn’t have made qualifying without them. Meghan’s parents Mark and Marty also came out to watch me qualify. Putting Race 3 behind me, I focused on my qualifying session trying to put in a good time to move me further up the grid for Race 4. I had some fast pace but struggled to find enough space. I kept running into traffic on the fast back section of the track losing precious time on each lap. I tried slowing down to give myself a gap but wasn’t able to get a fast lap together. Unfortunately, I ran out of laps and was only able to set a time of 1:41.517, enough to place me 12th on the grid. After qualifying friends Laura, Kim and Wade came by to say hello they had arrived at the track earlier and watched the qualifying session. It was great to see friends coming out to support me. They each got a chance to sit in the car, take a photo and also chat about the racing. With a few hours before the final race of the day I went over the checklist and made sure the car was ready. In the mad dash to reach the qualifying grid, I had to skip some of my usual checks and now it was time to go back and ensure everything was right with car. After my mistake and the multiple on track contacts of the weekend the car was looking a little rough. Rivets, aluminum and duct tape was now very much holding the bodywork all together. After fueling the car and finishing the checklist it was time to get a much needed break, feed myself, relax and get my mind ready for the race. Race 4 was a lot more fun with fantastic wheel to wheel action as the #95 Silver/Blue of Mark Hutchins, the #71 Red/White of Jerry Aplass and I battled to stay in the Top 10. Jerry got a great start and jumped ahead of us into Turn 2. We spent the first few laps swapping positions back and forth. On lap 6 the fast moving Bob Breton in the #51 Black/White car joined the mix passing us and moving us all down a position. On lap 10 Jerry had a fantastic run and went inside under braking into Turn 2. We ran side by side through Turn 2 with myself on the outside. Down to Turn 3 where now I had the inside line. I was able to hold him off and pulled in front coming out of Turn 3 and heading into Turn 4 but he was still hot on my tail. Then on lap 11 Mark ran wide on the exit of Turn 6 and spun dropping back several positions. That left Jerry and I battling to stay in the Top 10. Jerry would catch me in Turns 11 and 2 and I would pull away in Turns 6 and 9. We kept this up for the remain laps. With one lap to go Jerry was flying he made up a huge a mount of time and I could see him growing ever closer in my mirrors. Rounding the last corner Turn 11, I managed to stay ahead and finished 9th! Thank you to all our Sponsors and Partners. Thanks to Mark, Marty, Kim, Laura, Wade, Emmett, Aiden and Meghan for coming out to the track and the fantastic support. Huge thanks to Ric of CSR Performance for helping me to weld and patch up the car. Big thank you to all the SCCA Workers and Volunteers for a great event, they were very busy throughout the weekend with a large field of cars and so many sessions packed into two days. The next event is Races 5 & 6 at Thunderhill Raceway, 10-12 May 2019.